In March 2018, the City of Santa Barbara was awarded a $10 million grant by the California Department of Water Resources (DWR) to offset the $72 million cost of reactivating the Charles E. Meyer Desalination Plant. The Desalination Plant has been a permanent part of the City’s water supply portfolio since 1994 and in its reactivated state has been supplying water to City water customers since May 2017. The Plant serves a critical role in providing a high quality, local, drought-proof supply that is available for health and safety needs despite rainfall conditions. During reactivation, state-of- the-art technology and design practices were incorporated to minimize electrical demand and environmental impacts. The Plant currently produces three million gallons of drinking water per day. This is equivalent to 3,125 acre-feet of water annually or about 30 percent of the City’s demand. DWR’s Water Desalination Grant Program is funded by Proposition 1 which was passed by California voters as part of the Water Quality, Supply, and Infrastructure Improvement Act of 2014. Proposition 1 provided $7.5 billion in funding to improve California’s water reliability through increased water supplies, protection and restoration of watersheds, water quality improvement, and increased flood protection. 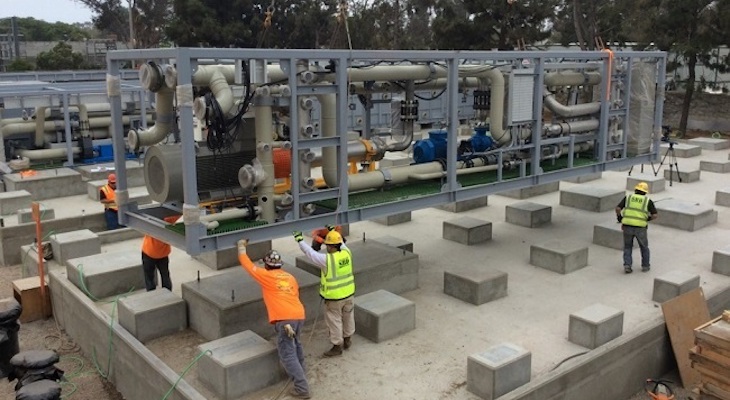 $100 million in grants were set aside for brackish or seawater desalination projects. The City would like to acknowledge and thank Senator Hannah-Beth Jackson for her support of Proposition 1 and her tireless efforts in supporting Santa Barbara’s work toward drought resiliency and desalination. Senator Jackson was instrumental in making it possible for the City to compete for these garnt funds given the accelerated scheduled for reactivation of the Desalination Plant. “As we work to address our region’s ongoing drought, it is critical that we invest in maintaining a reliable and safe water supply. I am proud that I was able to assist the City of Santa Barbara with securing this grant, as it helps ensure the City has a diverse and drought-resilient water system,” said Senator Jackson. For more information on the Desalination Plant, visit the City’s website at www.SantaBarbaraCA.gov/Desal or call the Water Resources Division at (805) 564-5378. And we must all remember that while this money came from an apparently distant pot, it is still tax payer money sucked from a heavily taxed citizens. Hana beth has never been a favorite of mine either, almost as useless as Lois Capps. I did like Walter and felt like he represented us well, his wife no. Our taxes are near historically low rates. This city propaganda piece is pretty embarrassing in its kowtowing to Jackson. If this is a grant that was given for merit and after competition one has to wonder what possible impact the weight of local politicians would have in a fair evaluation. On the other hand if this was, as has been suggested by others here, a mere boondoggle and charade.... Maybe, on the other hand, there were so few other jurisdictions who fell for this waste that there was no competition. In any event how come we still have no accurate information of the city long failed recycled water system? It is a ridiculous idea that the taxpayers of California would reward the relatively affluent residents of Santa Barbara for this exorbitant expenditure of money which will end up mostly benefiting Montecito estates and the company that builds and supplies desalination plants. Desalination is a costly and ineffective water production system as compared to ideas such as more effective uses, maintenance of the water lines, and recycling water collected in the sewage process. I guess thats better than asking for 10 million more from the citizens, after you sold off parts the last time.